Everyone has a wine lover in their life or family. What better way is there to surprise them this holiday season than to gift them with a Wine Gift Basket for Christmas. What kind of wine basket will you make? The type of wine gift basket you decide to make is entirely up to you. If you are sticking to a budget keep that in mind when you start purchasing the items that will fill your wine gift basket. Some wines can be expensive and could take up the bulk of your gift basket budget. You may decide to make a wine and cheese gift basket as I have. Think about the items you would enjoy yourself if you were sipping on a glass of wine and eating cheese. 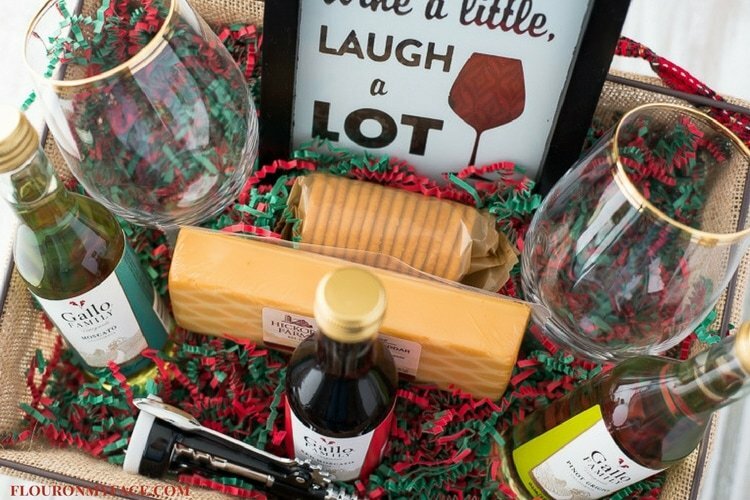 A few items you might fill your gift basket with is a bottle of wine, shelf stable cheese, crackers, a couple of wine glasses and if you like some cheese knives or small condiment knives. Maybe your gift basket recipient has a sweet tooth? You could make a wine and chocolate gift basket. 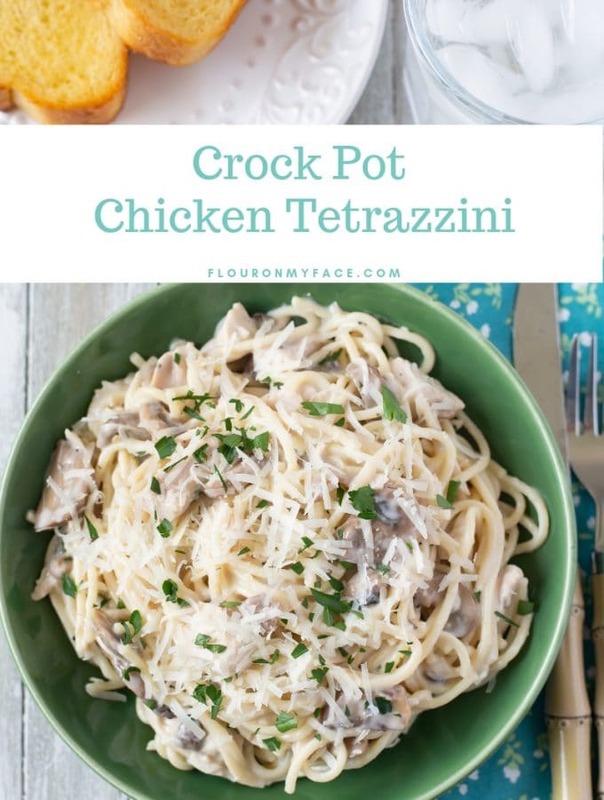 You could include a bottle of sweet red wine along with some decadent dark chocolate. 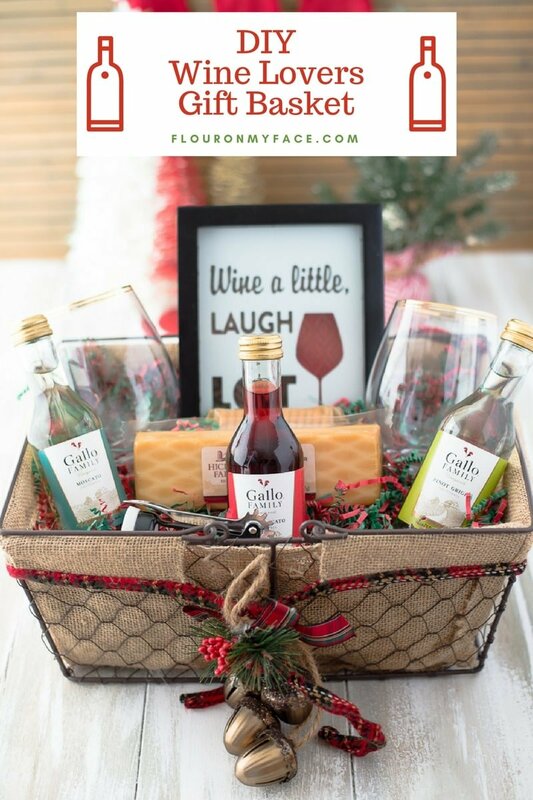 If you are planning to make a bunch of wine gift baskets this year, maybe you run a business and need to make some gift baskets or gift bags for your employees or business associates a wine themed gift is perfect. You can buy mini wine bottles in bulk like these mini Barefoot Cellars California Pink Moscato Plastic and Portable Mini Wine Bottles come in a case of 24. What to put in a wine gift basket? The first obvious gift item to put in a Wine Gift Basket is some wine, of course. 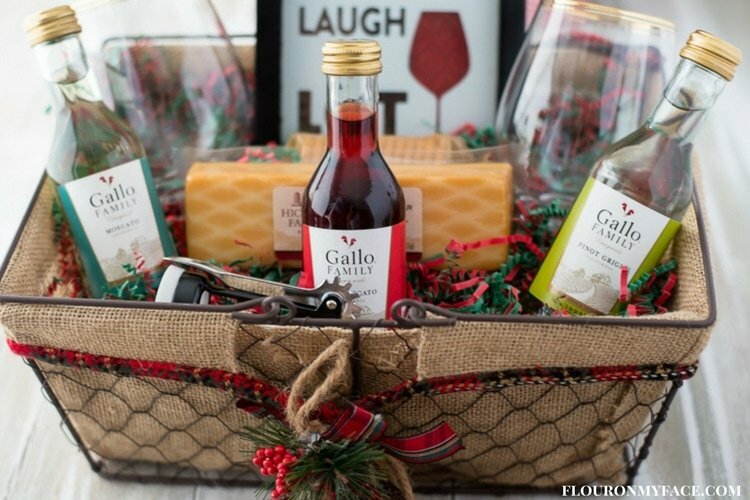 I chose to include 3 mini bottles of Gallo wines in my wine gift basket. I happen to love Gallo Moscato wine so I put a mini bottle of Gallo White Moscato wine and a mini bottle of Gallo Red Moscato wine along with a mini bottle of Gallo Pinot Grigio wine. I found these mini bottles of Gallo Wine at the Family Dollar Store in a special display but they carry the regular size and mini bottles of Gallo Wine all year long. Pick out a pretty gift basket for your Wine Gift Basket. Keep in mind the amount of money you want to spend. The bigger the gift basket the more wine themed items you will need to purchase to fill the gift basket. Fill the bottom of the basket with coordinating gift basket filler paper. If you need to add a little height to bring the gift items up higher in the basket stuff some rolled up tissue paper in the bottom and cover with the shredded paper filler. Start adding the wine themed gift items to the basket arranging them in a pleasing manner. You may have to move things around to get it looking just right. 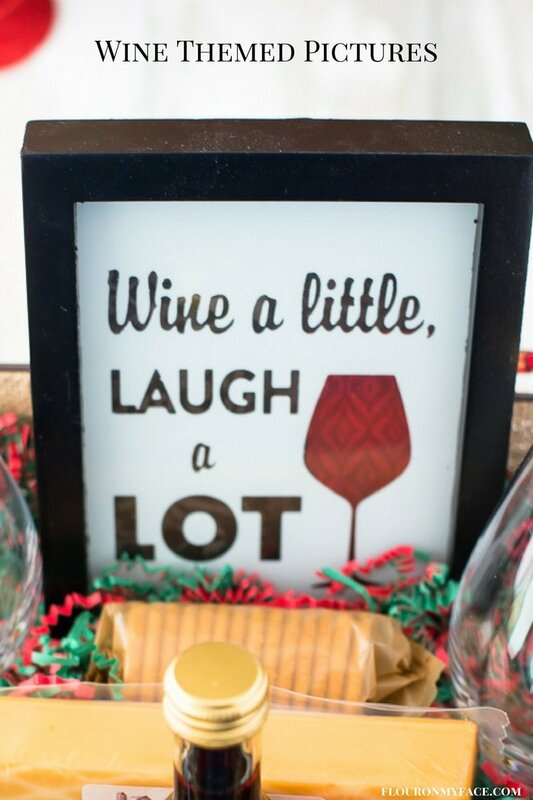 Use a cute wine themed wall hanging or a wine themed book as a focal point in the back of the gift basket and arrange the rest of the shorter wine themed gift items around it. Once you have all the wine themed gifts arranged in the basket the way you like it you can wrap the gift basket in cellophane or leave it the way it is. Add a gift tag to the basket if you like. Wine Folly: The Essential Guide to Wine: Wine Folly: The Essential Guide to Wine will help you make sense of it all in a unique infographic wine book. Designed by the creators of WineFolly.com, which has won Wine Blogger of the Year. The Wine Bible: The The Wine Bible is an Amazon #1 seller in the wine category. Which is understandable when you learn that the author, Karen MacNeil is the only U.S. winner of every major wine award in the English language, including the James Beard Outstanding Wine and Spirits Professional of the Year (2004).